Some Sprint customers are reporting slow data speeds now that the iPhone has finally launched on the country's number three network. There is a lengthy thread on Sprint's discussion boards, with iPhone 4S owners reporting extremely slow data speeds on launch day. Some report having difficulty using Siri over 3G because Sprint's data network was being so unreliable. One user said his Samsung Epic Touch with 4G turned off returned 3-times faster speeds than his iPhone 4S in the same location. 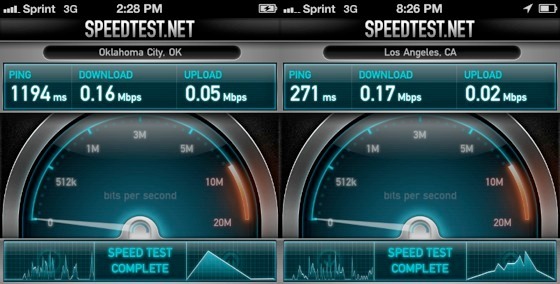 Another Sprint user claims that his new iPhone and his Evo 3D are both slow. A thread in the MacRumors forums shows that while some users are having poor data speeds on Sprint, others are having no problems, so it could be a signal strength or location issue rather than a widespread network problem. Gizmodo's unscientific speedtest survey is showing dramatically slower speeds for Sprint than either Verizon or AT&T. Sprint is the only U.S. iPhone carrier that offers unlimited data to new customers. It's unclear if this is just launch-week jitters, a more widespread problem with Sprint's network, or something in between -- as more and more Sprint iPhones arrive in the wild, we should get a clearer picture of Sprint's ability to handle lots of new data-hungry iPhone customers. Welcome to the party, Sprint. I love that in Oklahoma the ad wants you to get satellite TV, but in LA you're expected to be looking for a piece of a$$. it amazes to see the supposed #1 country in the world. This was 0.18 mbps, how is that even workable. Thanks to Siri, we can see that Norway is 125,021 sq mi. Sweden is 173,860 sq mi. The US is 3.719 million sq mi. I think I can forgive them for having some shoddy infrastructure. That is a huge difference in land area to cover. It's not problem with an Iphone it's just SPRINT'S NETWORK IS SLOW. I walked into Sprint store and wanted to install speedtest app on their Iphone 4S to see how fast their network is. Unfortunately you can't download apps to their demo units so salesperson offered me her android 3G phone to test Sprint's speed. After I DLed speedtest app and ran it, it showed me how SLOW sprint's network really was. Download was 0.3mpbs and upload 0.27 mbps. Sprint's network wasn't top notch to begin with. I'm not gonna LOL because I feel bad for those people, but this is exactly why I didn't choose to move to Sprint. I chose Verizon despite knowing they had slow-ish data speeds, but I knew they did at least have a robust network and had carried the iPhone previously. Sprint, no. Sometimes I really have to laugh at the poor internet connections you Americans have to deal with. I feel sorry for you. In my basement (!) in my house in a small town in Denmark I am getting a pretty consistent speed of 3 Mbit/sec both up and down with a ping of 80 ms on 3G. In every other way, though, the United States is a far better place to be in terms of technology and internet services. Not all Americans have to deal with this issue. Do you really think the size of your country is what matters? Distribution is probably more important than density but much harder to sum up in a single number. Righto, it's all about distribution. Well, mostly. Sure the US is big, but much of that area is very sparsely populated. So while it make sense network connectivity is slow in the middle of Wyoming, there is no excuse for the internet to be dog slow in places like the Eastern Seaboard. I remember reading somewhere that New Jersey had a higher population density than any principality in Europe. Something like 50 million people live in the corridor between DC and Boston, which is an absurdly high density given such a large area. There is no excuse for infrastructure to be lacking here. Unfortunately we have horribly asinine telecom policy (amongst others) and so we lag behind most of the developed world in this area (and many others). But hey, at least everyone here that has never visited another country still thinks we're the best. So we have ignorant confidence, and you got to smile at that. Uh your verizon numbers aren't possible to be that high (you're above theoretical max, and WAY above many many nationwide tests), you sure you're testing correctly?